The master cabin has a large en suite head w/ jacuzzi tub & separate shower. Crew has a separate companionway, head and shower. Howard is a charming Captain who loves the ocean and has a passion for local history. Creative, fun and entertaining he will ensure that you enjoy every experience and have the vacation of a lifetime aboard MATAU! Lara is a keen sailor with exceptional service skills and an impressive mixology portfolio. Very upbeat, relaxed, friendly person, who’s interests include water sports, hiking, shotgun shooting and salsa dancing. A creative and talented chef with a decade of experience. She has a great passion for food and only uses the freshest and most sustainable ingredients to create her dishes. She will customize your menu to meet any special dietary needs. She’s happy to share the best that life has to offer with guests. The trip was fantastic. Marques, Teal and the crew were outstanding and we would recommend them and the Matau to others. We are pleased that we did the full week on the boat after all the hassles. Itinerary was just right with lots of activity and beautiful scenery. I just wanted to share my thoughts with you, on this past charter we just finished on Matau! It was beyond my wildest expectation! As you know, we are not always the easiest clients to make happy because we have sailed so much in our lives! With this said, this crew surpassed my expectations and has raised the bar very high for any future crews we may encounter. The only way for me to describe this past crew/trip is to really go down the line of crew members and tell you what impressed me the most! The only place I know where to begin listing all of his attributes is to start with his very easy going and genuine personality. He loves people, sailing & the job of playing host to all aboard. I can't even begin to tell you what a natural fit he is for this job of captain on Matau! We all felt comfortable asking for anything or just questions we had every day as they came up. He has a charm about him that makes you want to hear his stories and adventures in sailing. We all loved that he would sit and be one of the group during coffee hour and cocktail hour! During the week we had some strange stuff arise and he handled it like a perfect gentleman and did exactly what I hoped he would do with everything that was thrown at him! He handled it all with grace and style, along with some laughs which I appreciated greatly! We also loved that he took pictures of our group throughout the week and gave us a slide show of some of the super funny ones at the end. It was a great way to end our vacation. Brian is amazing. He is everything you see or have heard of in regards to personal service on giant motor yachts. He pays so much attention to everyone and literally he is always looking or thinking what you're going to do or need next!! Where ever he is on the boat, he is always watching anyone that is close proximity to him and looking for ways to make them more comfortable. If you dive into the water he is always keeping an eye on your safety and setting your towel out for when you get out. If it is cocktail hour he is helping Teal pour drinks and move chairs to sit on the back watching the sun set. He swims right beside the weaker swimmers and just makes everyone feel pampered, safe and comfortable. He even had to get up in the middle of the night for something and he did it with a smile. He is such an asset to this crew and to guests. I am praying he never leaves Matau ever!!!! Many days I often thought that Teal has the hardest job on Matau. She gets up the earliest and is the last to bed! She takes so much pride in her job. She wants everything to be perfect. From table settings to your cabin and its cleanliness. Her job is physically endless and on many days thankless, I made sure she knew how much we appreciated everything she did because she works so unbelievably hard! She is your server, table decorator, cabin steward, butler, and basically Mom to everyone. She and Marques make an incredible team together!!! I admire her stamina, hard work and attention to every detail and guest on board! Ashley is not a permanent crew member on Matau but she worked very hard on each and every single meal during our trip. She made everything healthy, unique and aesthetically appetizing! Nothing was ever boring or routine. She could make eggs in a way that you had never seen them or thought you would ever like them. She could make boring oatmeal creative and fun!!! She is a great chef and I hope more Matau guests get to enjoy her cooking style. The type of meals was just as I asked, "healthy," and even our friends who aren't the healthiest eaters loved her food! That is a hard challenge to accomplish! This crew is so wonderful and amazing that it has made me want to sail a new area with them at a time when we usually do not do sailing trips. This is how much I hold this crew in high regard! 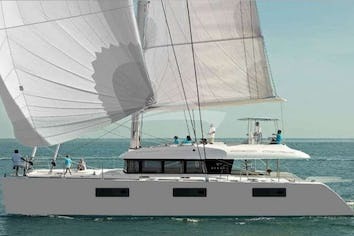 Catamaran MATAU, 75’ Privilege – More rave reviews! Capt. Marques, Teal, Brian and Ashley surpassed my expectations and raised the bar very high for any future crews we may encounter. MATAU’s crew is so wonderful and amazing that it has made me want to sail a new area with them at a time when we usually do not do sailing trips. Broker: Thank you all very much......I have never seen better comments! From the moment the four crew met us off the taxi I thought, 'This is looking good'. What followed from that point was a holiday of a lifetime. Matau was perfect in every way with a perfect crew. The food was outstanding and well above the standards expected in a five star hotel. I have been travelling internationally for thirty years now and have stayed in many of the world’s top hotels both on vacation and business. I cannot recall anything as good as this! We just returned to FLL after a fantastic weekend onboard Matau. The crew were great and we loved the ride. Certainly got our sailing catamaran fix. Jim and Marcy loved it. Our family just returned home from our cruise on Matau. We had a perfect week over New Year's and could not have asked for more. The crew was so delightful and accommodating. Capt. Drew made us feel so welcome and was so knowledgeable. He always had bits of island information for us. Nothing was too much to ask of Drew and the crew. They were always willing to do one more wake board run, or one more snorkel trip. Drew was great with our granddaughters ages 10 and 8. Brian was such a hard worker - always there to help us. He works so well with the others. The one thing I noticed about the crew was they were always there when we needed them but never in our way. Nothing was too much to ask of Brian -- our granddaughters loved him and he was always making them laugh. Susannah - what a delight. So pleasant, so knowledgeable about the BVI's. She kept the boat spotless, always coming up with wonderful table settings but best of all she planned great activities for our granddaughters from doing a message in a bottle to arts and crafts. She was always there to get us anything we needed. And last but not least Rob -- what a fabulous chef and all around great guy. He was so good with the children always making them laugh over something funny he would do. We dined like Kings for 7 days. Our son-in-law is a vegetarian and Rob fixed him a separate meal at every meal and always came up with fabulous recipes. One day we had Pirate Day and the crew came running out with swords flying and pirate costumes to frighten us. Then our granddaughters dressed up in the costumes and it was hysterical and made for great picture taking. We always had beautiful spots to anchor with great snorkeling. I hope you can forward this email on to the owners so they too will know what a fabulous crew they have. If anyone ever wants a recommendation for Matau, please don't hesitate to have them contact us. Here is a poem that the guests wrote this week. And bring home a love for the BVI, sea to shore. We enjoyed a truly once in a lifetime experience aboard the Matau … the incredible experience that was provided to us by Virginia and her amazing crew. Their attention to detail both in terms of the care and operation of the yacht, and for our total experience was truly over the top. We formed lasting friendships and have permanent memories that are truly indescribable. Should we ever choose to relive this wonderful time, it would have to be aboard the Matau and without a doubt, with Virginia and her incredible team. I'll be recommending the Matau and Virginia to a few select friends of mine who can fully appreciate what we experienced. I wanted to share the lovely feedback letter I received from the Wesson group who just got home from Grenadines onboard MATAU. Thanks to ALL for assisting in making this a wonderfully successful charter. 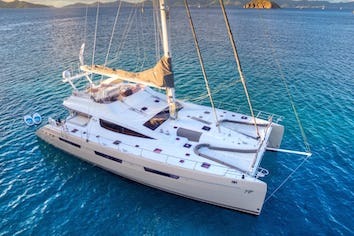 Special thanks to the owner for making it easy for me to sell them the week of the Tortola Boat Show! We returned from our trip aboard the Matua Saturday evening. I cannot express the experience our group of eight had on this yacht. From the catamara to the crew.....we were met with the utmost in hospitality, quality of service, beauty of the ship, etc . Our expectations were far exceeded in every aspect. The grace in which the Matua sailed the Caribbean waters, the professionalism and courteous nature of the crew I do not believe could be matched anywhere. The pride the crew showed for the Matau, the pride in which executed their jobs each and every day was evident throughout our trip. The food and the presentation of the meals three times a day far surpassed any five star restaurant I have ever had the pleasure of dining in. Each meal was carefully planned with all of us in mind and the tables were decorated differently each meal with elegance. Again, words cannot describe adequately the experience we had. Attention was paid to every detail and many details were added that we would have never thought of that only added to our experience. St. Vincent and the Grenadines is now my favorite place in the Caribbean. I have travelled the Caribbean extensively and have seen almost every island and group of islands. I cannot wait to return and have more time to explore this beautiful and untouched part of the world. The of this area are rich and vivid. The people of St. Vincent are gracious, accommodating, and very kind. Captain Virginia asked me how I found you. I told her that I had searched the internet extensively and was working with three different charter companies looking for the perfect boat. 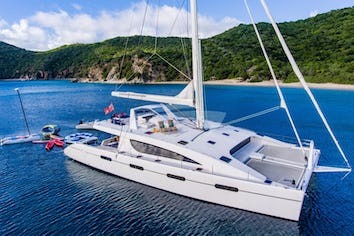 I also told her that you were the only person who took a special and personal interest in trying to help me secure the Matua for this charter as she was scheduled to be a part of the Tortola Yacht Charter Boat Show. It was with your determination and persistence that the owner of the Matua agreed to pull out of the show and accommodate us. I know it was meant to be for us to experience the trip of a lifetime aboard this beautiful boat. Any other boat would have left us with a lesser than feeling. We are already looking at when we can charter this beauty again. Captain Virginia also passed along to me how impressed she was with you, constant communication and it was a joy working with you from her end as she had never worked with you before. Job well done! Thank you for your assistance and your part in helping us charter the perfect trip and memories of a lifetime! I will forward pictures in a separate email...we took over 2400 pictures. I hope that we can all work together again very soon. The real point of differentiation was the crew. All I can say is Wow! They were unbelievable and so much fun to be with. The service was five star from the time we stepped on the boat until we left. Virginia and her crew always had options for us each day depending how we felt. She organized hikes, amazing snorkeling trips, water skiing, tubing and always found beautiful spots to anchor and spend the night. Chris, the Chef was simply amazing. Each meal was a much anticipated treat that we all looked forward to and appreciated greatly. Alice was so attentive to all of our needs and our kids really enjoyed her. Jamie made the trip so special as he took us on some great adventures and educated us on the islands, fish, history etc. He was always there to take us where we wanted to go and had fun doing it. I can’t say enough about the experience but when I asked each of our family members if they would like to charter MATAU again or try another yacht, each person said, “MATAU with the same crew.” I think that says it all. Follow-up broker emai: Obviously they had a fabulous time thanks to Captain Virginia and her crew. I always know that when I put my clients in her capable hands, I am confident they will be well taken care of and they always are. Please thank Virginia and her crew for another superb charter!!! We had a marvelous time! The crew was fantastic and Andrea’s cooking was superb! We had so much fun. Weather was perfect till the last day but that was OK not much of a problem. We would travel with that crew anywhere! Thank You so much for hooking us up and working it out. Three couples, July 12-19, 2008. Kotor, Montenegro to Dubrovnik, Croatia.